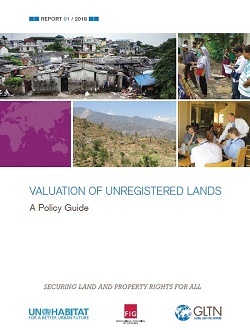 Valuation of unregistered land in developing countries is in the critical path of achieving many important global, regional and national develoment goals such as: addressing climate change, sustainable urban development, food security, promoting responsible investments, addressing conflicts often associated with large-scale land investments, and common human rights abuses associated with land all which if not checked affect the poor and women most. In many developing countries only thirty percent of land rights are registered and valuation has generally been focused on this registered land. Valuation of unregistered land approach is to support developing countries that have unregistered land to be able to value it. Valuation is necessary to improve control over land and property in a way that builds equitable access to financial services and mobilizes resources for economic growth and poverty reduction. It is critical to upgrade informal settlements, support the resettlement of displaced people and for investment and development projects. It is vital for improving transparency in opaque land markets, which disadvantage the poor who may lose out on getting the right value for their land and would entrench poverty even further in their lives. The Global Land Tool Network (GLTN) and FIG together with other GLTN Partners including RICS joined hands in the initiative to develop a guide for valuation of unregistered lands. This work started all the way back in 2010 and has since then been underway with an ongoing process with research, expert group discussions and improvements. The discussion and experts’ feedback have now led to the ‘Valuation of Unregistered Lands: A Policy Guide’. The policy guide is intended for valuation practitioners, land professionals, policy makers and stakeholders involved in the valuation of unregistered lands. The global agenda in the guide provides the ethical framework to value unregistered land to ensure equity, ethical considerations and fair valuation judgments, inclusivity and sustainability. Challenges encountered while undertaking valuation of unregistered lands form the focus of the suggested framework to value this land. The framework entails using both conventional and innovative approaches with recognition of the social construction of value through social market value. The guide serves to strengthen the implementation of the continuum of land rights, a key tool to strengthen tenure security for all. The guide was launched first at the GLTN partners meeting in Nairobi 24-26 April 2018 and at FIG Congress 2018 during a festive session where the guide was presented and celebrated. Please read the guide here.